I have been in a friendly debate lately regarding the location of the Jesuit mission of St Ignace or what has become known as St Ignace ll that was designated as a National Historic site in 1955. As a result of these discussions I was reviewing the other purported locations for this Jesuit mission of 1649 and thought that it might be interesting to create a list of other named localities existed in Tay township during the historic Jesuit era of 1635-1649. 1. - The best known of these sites is Ste Marie among the Huron on the Wye river. This was the home of the Jesuit and a French fort between 1639-1649 and is designated as a National Historic site. It was not a native village and hence had no native name. 2. - Kaontia - this was a Wendat village reported to be within 1 league or 4km from Ste Marie and some think that it was called Ste Anne by the Jesuits. 3. - Ekhiondastsaan - this was a Wendat village that does not appear to have been given a name by the Jesuits but may have been known by the French as La Chaudiere. 4. - St Louis mission/village is designated as another National Historic site whose location is very much associated with the location of St Ignace ll. Not all agree to the true location of this village and it does not appear to have had a native name. 5. - St Denis appears on some Jesuit maps relating to this time period but does not show up with a native name. 6. - St. Jean appears on some Jesuit maps but does not show up with a native name. 7. - St Joachim appears on some Jesuit maps to be north of St Jean but does not show up with a native name. 8. 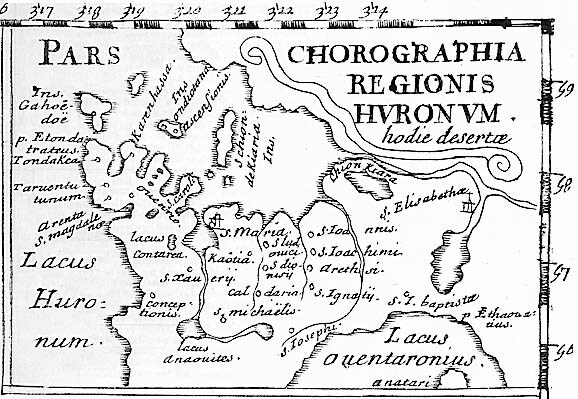 - St Ignace 1 shows up on some Jesuit maps. 9. - Ataratiri, this village location was once thought to be that of St Ignace ll and efforts were made to start the development of the Martyrs' Shrine and was known a Martyrs' Hill. 10. - Arethsi, is thought by some to have been a major village of the Cord Nation of the Wendat that occupied Tay township at the time of the Jesuits and that no Jesuit or French name is associated with it. Some think that this location was St Joachim and there is one purported Jesuit map that links Arethsi with St Ignace 1. Given that the Wendat villages moved when they ran out of a sufficient supply of wood or the land was no longer productive, it is no wonder that we have far more archaeological sites dating to this period that we have named villages/missions in this list and given that each of these locals was the home of 500 to 1500 individuals the population of Tay might have been quite close to what it is today. When the villages moved, did the native village name move with it? In most cases from what I can tell this was the case but not always. Villages move for different reasons and different distances but I believed stayed within the same general district that may have been defined by their hunting territory and or the stream, creek, river valley that they resided close to. The name of the villge was sometimes influanced by the physical location of the village as we may call a place edgehill or mountainview. Other seem to be determined by the name of a well known chief or other notable person like Perkinsfield after the Perkins farm etc. If either the location vista or the lead personage changed at the time of the move then this may have resulted in a change of name. At least this is my take on what may have been the cause of some of these village name changes.